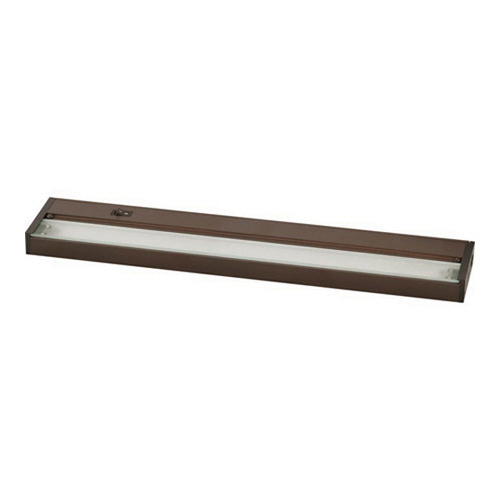 Progress Lighting Hide-a-Lite III Collection Undercabinet fixture employs four 9-Watt LED lamp that delivers light of brightness 425 Lumens. The LED lamp has color rendering index of 80+ and color temperature of 3000K. It has voltage rating of 120-Volts and fixture wattage of 36-Watts. The tempered micro-prismatic glass lens shade brings elegance to the home. This fixture in antique bronze, baked enamel housing finish, has average life of 35000 hours. It features extruded aluminum frame and polycarbonate end plates. It has dimensions of 18-Inch x 3-1/2-Inch x 1-Inch. Fixture is UL/cUL listed.